Right click using a Fn key and the mouse button at top left; keep the mouse button depressed and release the Fn key; still keeping the mouse button depressed, move the cursor using the trackpad as you normally would. And no, the diNovo Mini really doesn’t have any true Function keys (F1-F12) – another very common search term used to find this article. One of the most useful things you can do with a modern television is use it in conjunction with a PC. A full HD (1920 x 1080) LCD television has far higher resolution than the majority of PC displays and works well with a HTPC ( Home Theatre PC) games console (Xbox or PS3) or Media Centre PC. Even an old Pentium 3 class desktop PC makes a great way to view your favorite photos, downloaded videos, NASA TV or Youtube. While it is easy enough to tuck such a PC away there remains a problem with how to control it. A wired keyboard and mouse is out of place in the average lounge or TV room setting and anyway the PC needs to be controlled from some distance away (the 10′ interface). The Logitech diNovo Mini keyboard is intended for exactly this situation. The diNovo Mini is a small, rechargeable handheld wireless keyboard and mouse that can replace more conventional input devices in situations where only occasional input is required. The diNovo Mini is an attractive, small, black and silver clamshell keyboard. It is intended for handheld use, and is probably most easily held in both hands with fingers supporting the keyboard and thumbs operating the keys. The Mini has a dark grey transparent lid, a black keyboard on a silver casing, and a dark grey rubberised removable cover on its underside. The device looks really stylish, seems very well made and is superbly detailed and packaged. Opening the clamshell lid activates the keyboard and at the same time turns on the keyboard illumination. Continued backlighting of the keys and other controls is dependent on ambient lighting; in poor light pressing any key will re-activate backlighting while in good light the backlight will remain off (don’t worry, the keyboard is still working!) The main keyboard is always illuminated orange, while the touchpad is either illuminated orange or green depending on the mode selected. The main keyboard keys are located centrally with the “ClickPad” (or touchpad) located top right. To the left of the touchpad is a slide switch that sets the touchpad mode. Top left is a dedicated mouse button; to its right there are 3 user definable keys and several media control keys. There are no function keys, although there are two modifier keys (placed left and right of the “space” key) labelled “Fn”. These change the behaviour of some keys, and also modify the mouse key to provide a secondary button (normally a right click). When pressed these keys also temporarily change the touchpad mode. A small power socket on the rear of the body is used to recharge the keyboard – a removable Lithium Polymer battery is accessible by unclipping the base cover. There is no ability to charge the keyboard from a USB port. Since this keyboard will need recharging, and will also always be near a PC, USB charging should have been a no-brainer. Instead, Logitech have inflicted upon the user yet another proprietary wallwart. Beside the battery compartment is a space to securely store the supplied bluetooth USB dongle when it is not required – a nice touch. Also supplied is a microfibre cleaning cloth; a microfibre storage bag would had been much more thoughtful. Keys are very small, and not staggered as is usual on a normal keyboard. As you would expect, this does make typing difficult and tends to limit the amount of keyboard input. The keys have a very rice action and are slightly domed which compensates for their size to some extent. Keys are labelled in a thin rectangular font which is not particularly easy to read. Most keys are labelled in white, the labelling appears orange when backlit. Some keys have a “Fn” modifier which is labelled in a small blue font; unfortunately this is neither backlit or easy to read in ambient light. To make matters worse, the layout of the modifier keys seems quite illogical – for example the “Enter” key is also used for “Ctrl Alt Del”; “Delete” is the secondary function of the “0” key; “Esc” is the secondary function of the “Tab” key. The lack of function keys is an annoyance. Instead of pressing “Alt-F4” to always close a window, it is necessary to use either “Alt,F,C” (close) or “Alt,F,X” (exit) with no consistent way of knowing which will be required for each window. There is a dedicated key to launch Windows Media Centre (not programmable for other uses for systems that are not running Media Centre – so quite a waste of space); there is a “Windows” key but strangely, no context menu key. There are media transport keys (play, pause, stop, etc) but these only work in Windows Media Player and again, can’t be re-assigned by the user. Another waste of space. There are many media players that are better than WMP and it is highly likely that people using a diNovo Mini will be using a decent media player like VLC or Media Player Classic. Ignoring their requirements seems short sighted – even though VLC has a good set of hotkey defaults, the casual user will be looking to use the labelled transport keys on the diNovo which do nothing. However, there is some good news (for Windows users, anyway) as The KMPlayer works with the default media control keys and is an excellent media player also. Do not confuse this with the KDE based KMPlayer; this is quite different. Start at http://www.kmplayer.com/forums/index.php. I find there are a confusing number of options and settings available, but it is easy to use the player without needing to make any adjustments. In addition, it plays everything I’ve tried it with, including .mkv files with subtitles, and it also plays HD video on my slow hardware perfectly, where even VLC has problems. Another excellent media player to consider is Media Player Classic – Home Cinema, from http://mpc-hc.sourceforge.net This is a development of the original excellent Media Player Classic and it is much improved. Performance on my hardware with HD video is even better than the KMPlayer, and the default transport key bindings on the DiNovo Mini work perfectly. And even better – MPC-HC is open source. On the left of the keyboard area pair of keys which in touchpad mode scroll pages up and down, in Media Centre mode these keys are used to zoom in and out when viewing images or web pages. A 30mm diameter circular touchpad at the right edge of the keyboard is used for cursor control. In touchpad mode, this works the same way a laptop touchpad does but with one major and disappointing difference. Instead of being able to use the touchpad itself for left click (by tapping once) or right click (by tapping and holding), left click is performed either by a pressing on the touchpad to operate any of the switches underneath it, or by pressing a key located on the far left of the keyboard. Right click is only possible by using the mouse key at the left of the keyboard and the “Fn” key (which means moving your finger off the touchpad) and to further compound this shortcoming there is no dedicated context menu key (which would make right mouse clicks redundant). Right click drag and drop is a little tricky, and not immediately obvious. The problem is that, when you right click you press one of the Fn keys, which switches the trackpad to Media Centre mode, so you lose the mouse function. The trick is, to do a normal right click using a Fn key and the mouse button at top left; keep the mouse button depressed and release the FN key; still keeping the mouse button depressed, move the cursor using the trackpad as you normally would. While the touchpad is quite accurate and responsive if you use your finger, it seems more comfortable to use your right thumb. Unfortunately the touchpad is so small compared to the size of your thumb, that accuracy is affected – some people will struggle to use the touchpad this way. The touchpad is capable of operating in two modes. In “cursor” mode (selected by sliding the mode switch to the right – the touchpad perimeter glows orange) the touchpad operates in a way very similar to a laptop touchpad. A light touch of a finger or thumb is all that is required to move the mouse cursor around the screen. Unfortunately, left-clicking is performed by depressing the whole touchpad and operating a micro-switch below it, rather than tapping the surface with your finger, as is common on laptop touchpads, and which I much prefer. In “media remote” mode (for use with Media Centre) the touchpad is illuminated green and operates as a 5 way navigation pad. This is suited to navigation in Windows Media Centre or other situations where menus are structured to favour directional rather than mouse navigation. At any time you can temporarily change from the switch-selected mode to the other by pressing one of the “Fn” keys. I suspect this behaviour and even the existence of the mode switch itself will be confusing for some people. Setting up the keyboard to work with the supplied bluetooth dongle is easy. All that is required is to install the drivers and software then press the button under the keyboard to pair it with the dongle automatically. There is no need to enter a passcode. 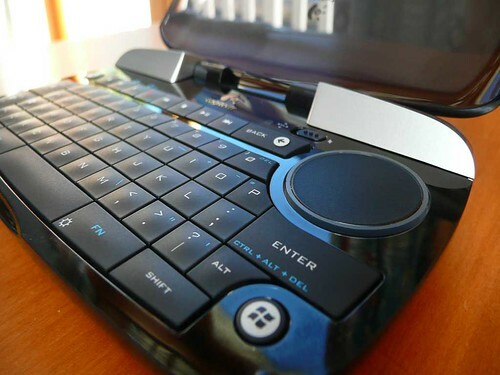 The keyboard will also work with devices with integrated bluetooth, and a small slide switch under the base cover is used to set up operation with a PS3 games console. When running, the Logitech SetPoint Control Centre appears in the system tray. Hovering the cursor over the icon displays the battery state of the keyboard. Clicking on the icon opens the settings for the keyboard and mouse. Normal adjustments are available for the mouse – cursor speed, acceleration etc. There are also settings available for the user-definable keys. Unfortunately these are extremely limited. One key can be programmed to switch the system to standby, hibernation or to shutdown completely – with no other options. One key can be set to to launch the default web browser. Only one key can be customised to any extent, in that a single-level menu can be constructed to launch programs of your choice. The presentation of this menu is fixed and is not suited to use where it will be viewed from a distance. Even more annoying, when the menu pops up, none of the choices are highlighted so it is not possible to navigate using the direction pad – you have to use the touchpad, irrespective of what mode you were in when you initialised the menu. There is no ability to program other any keys (or combinations) to perform specific tasks, run macros and the like. Considering the very high price of the Mini, I consider it unacceptable that this product does not ship with better software. Users who wish to extend the capabilities of the diNovo Mini using 3rd party software would do well to investigate Launchy (see my review of Launchy at https://hindesite.wordpress.com/articles/launchy/) or some other keyboard utilities (see https://hindesite.wordpress.com/articles/mightier-than-the-mouse/). One enterprising developer (Richard Owens) has written UberOptions, a plugin for the Logitech SetPoint Control Panel. This allows users to extend the Logitech software so they can re-map mouse and keyboard buttons and actions. Available from http://www.mstar.net/users/rlowens/uberOptions and also at http://www.mstarmetro.net/users/rlowens/. This will be of use to power users of almost all Logitech input devices, not just the diNovo Mini; it provides some of the functionality that Logitech should have included in their software. You may need to spend some time with this software as the options are very deep – chances are that whatever you want to do with your keyboard and mouse, this plugin will make possible. A very nicely made, stylish and expensive device that is annoyingly Windows Media Centre-centric and disappoints in actual use. While still very useful, this could have been so much better with very little effort. awesome review! thanks a lot! thx for the inf. I was searching a way to Alt-F4 (close) browser windows/programs; I guess as mentioned, this function does not exists. My DiNovo had fallen into disuse after I abandoned my Myth TV box in favor of a hacked Wii media center, so I never really mastered using it.I wish id found this post back then. It’s extremely clear and helpful writing! The DiNovo is proving very useful now for controlling my Toshiba Thrive tablet when plugged into the big screen media center. Thank you for this helpful post!